My son has a friend over tonight for a sleepover. I’m going to make my world famous Broccoli Forest mac’n’cheese, toss it into a casserole dish and into the oven. Thirty minutes at 350 will do it. We’ll have dinner, then sometime later after the Leafs start losing their hockey game we’ll make a big bowl of popcorn, plunk ourselves down on the couch and watch an illegally downloaded Battle of the Five Armies Hobbit movie. Casseroles make life easy and they look great in the right dish. In the last few years we’ve bought a lot of vintage Pyrex bowls and dishes not so much because we needed them but because they’re neat. Most of them are too small for tonight’s dinner, but they look damn fine in our cupboard. The older the better, they come in vintage green, gold and orange which would have looked lovely on a 1950s dinner party table. The 1950s. What a time to be alive. What a time to eat! 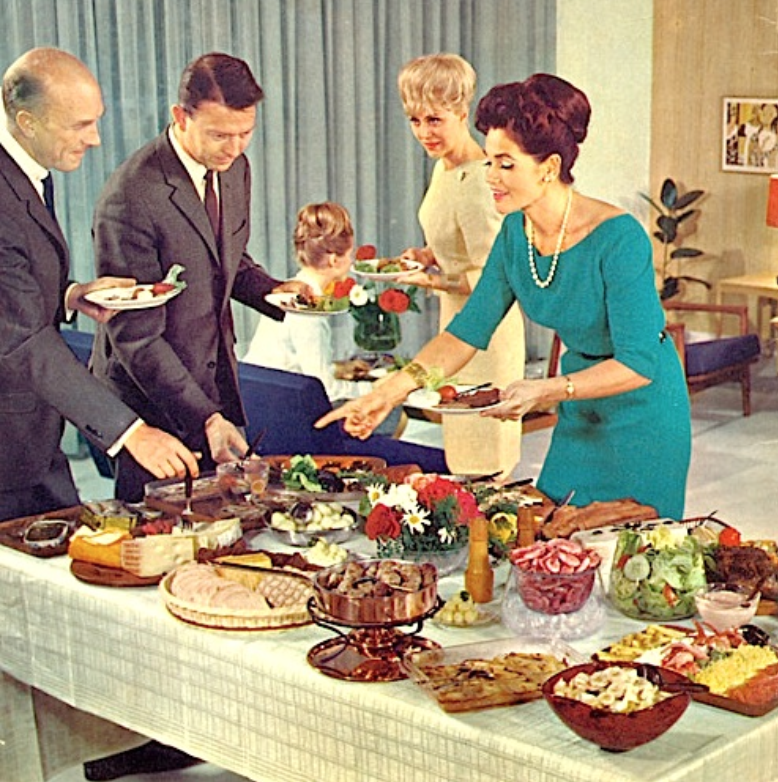 It was an era of prosperity, the war was over, people had money, they lived in the suburbs and did their entertaining at home. Every man had a job, bought a house for his family while his wife stayed home raising their 2.6 children. She would cook and clean and buy stuff from Avon. She’d smoke and serve coffee and tea to neighbourhood wives who would stop in after the soaps were over. Soon after being left at home all day in the middle of the suburbs without a car she would start popping Miltowns because her stultifying routine was causing her to lose her mind. The martini she served her husband when he came home and announced “Boy are my dogs tired” wouldn’t have been the first one she made that day, but the third. They would have dinner parties. These would be more formal affairs than the ones we have at our house where I sometimes serve our guests with slippers or Crocs on my feet. They didn’t do that then. They wore proper shoes around the house, the men in Florsheim loafers and the women in pumps that matched their accessories. They wore fashionable dresses, the men wore their best suits and Brylcreemed their hair. No doubt convo was light and lively, especially after a few G’n’Ts. Keep ’em coming, Mabel! How fun! 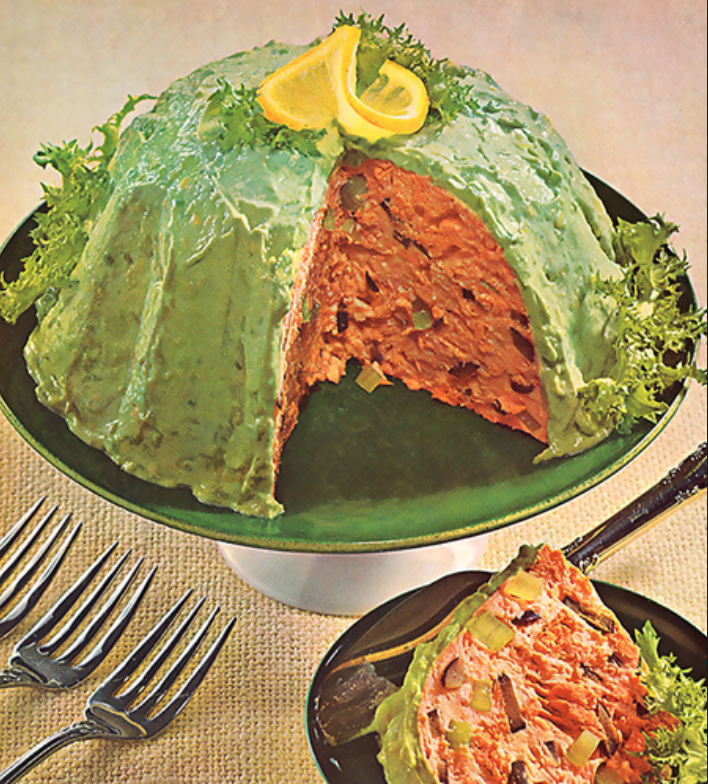 Eventually they would sit down to eat at tables laden with ostentatious food creations, flamboyantly adorned with colourful dressings and gaudy decorations. All colours would be present in the dishes – green, yellow, orange, white, red, the more colourful the better. Deviled eggs, meatloaf, tuna casserole, baked Alaska, with meats so abundant and varied that the the whole barnyard would be represented. Especially steak! 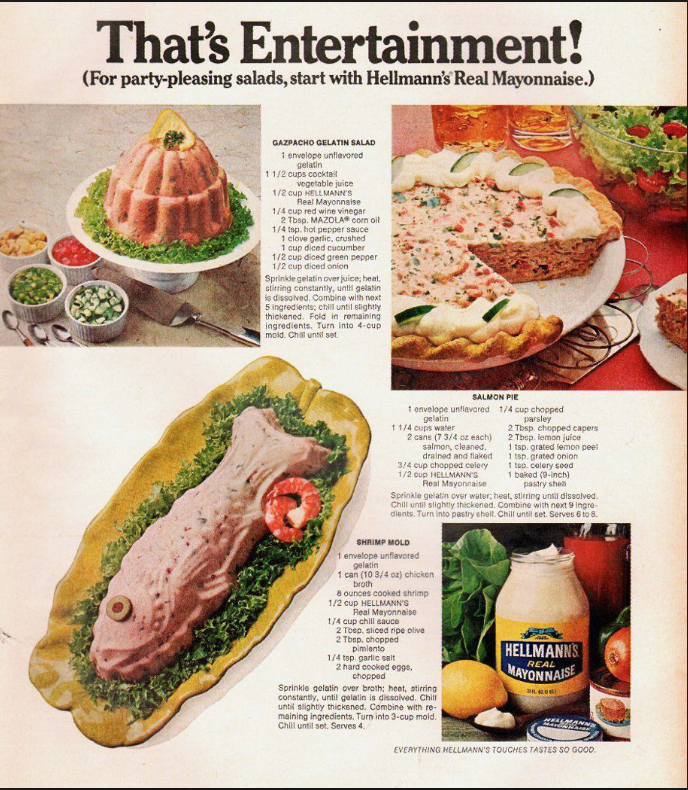 And finally, no table was complete without at least one serving of something suspended in gelatin or aspic. 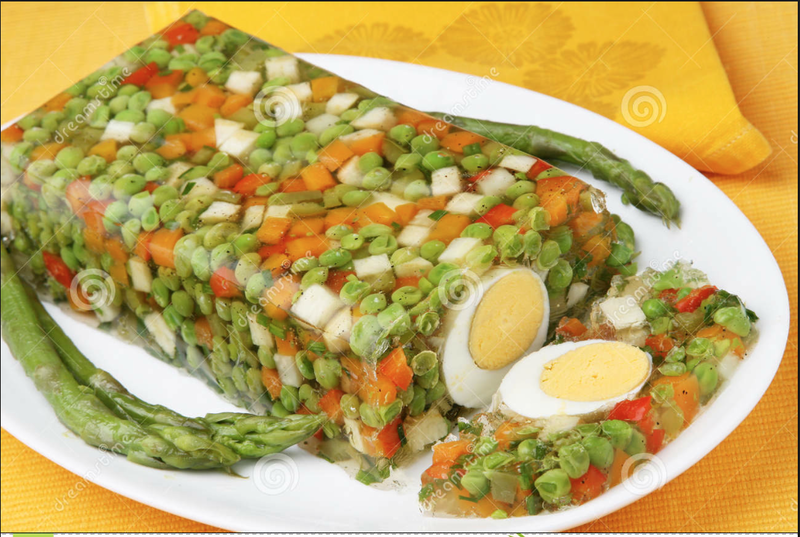 Gelatin and aspic. I don’t think there is anything more disgusting than the renderings from boiling the skin, ligaments, tendons and bones of animals. 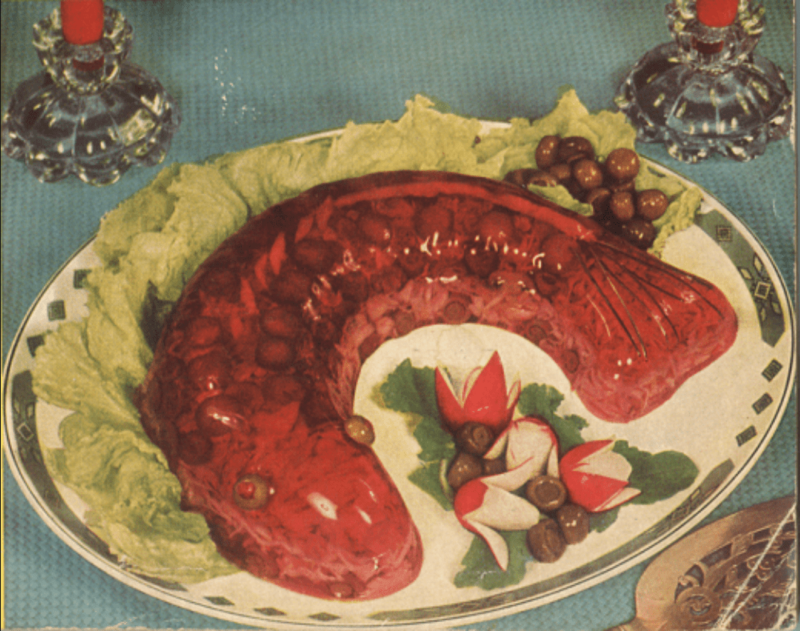 Gelatin was used more often for sweet things; aspic was just gelatin mixed with a consommé or meat broth, used more often for savoury dishes. 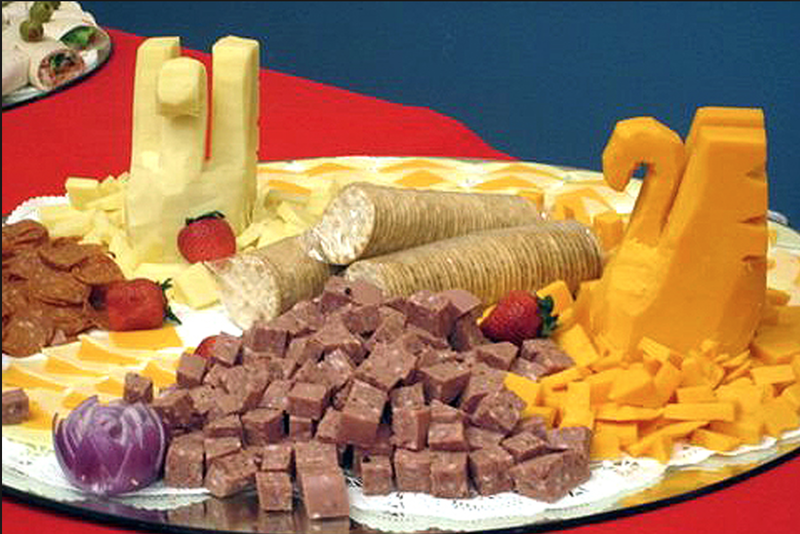 I have a problem with some food textures. 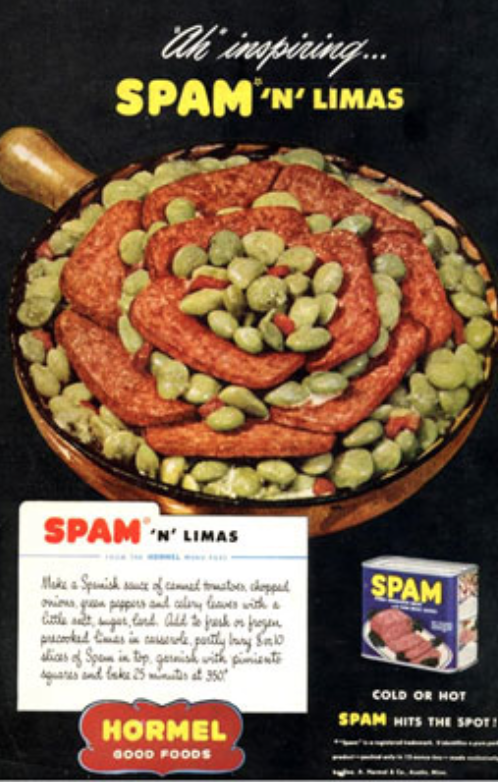 The thought of biting through gelatin to get at a piece of fruit sends my stomach roiling; the thought of biting into the same substance to get at a chunk of boiled pork is gag-inducing. Almost as bad as biting down on a piece of gristle in the days when I ate meat. Anything that my teeth bounce off of has no business being in my mouth. 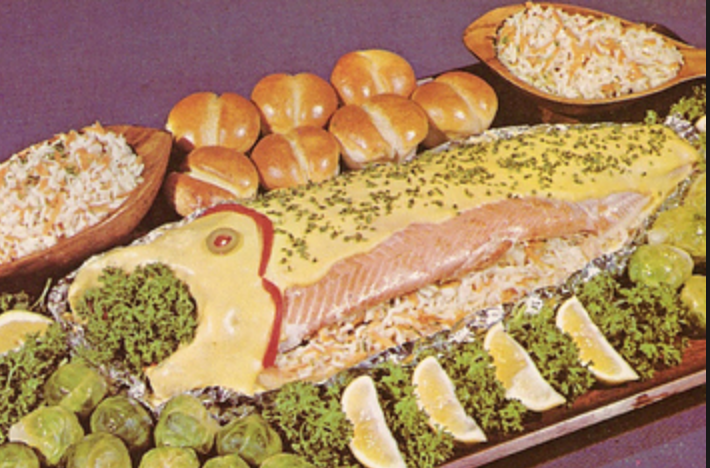 Check out these glorious creations. This entry was posted in Ramblings by budbug. Bookmark the permalink.